Well the old school project rumbles on this time I have painted some figures. I got these figures from my friend Dave who gave me 3 boxes full of interesting and old figures. Raking around I found some really interesting, and old stuff, all dating from the late 70’s/ early 80’s. First up, Boris the thief and liar. 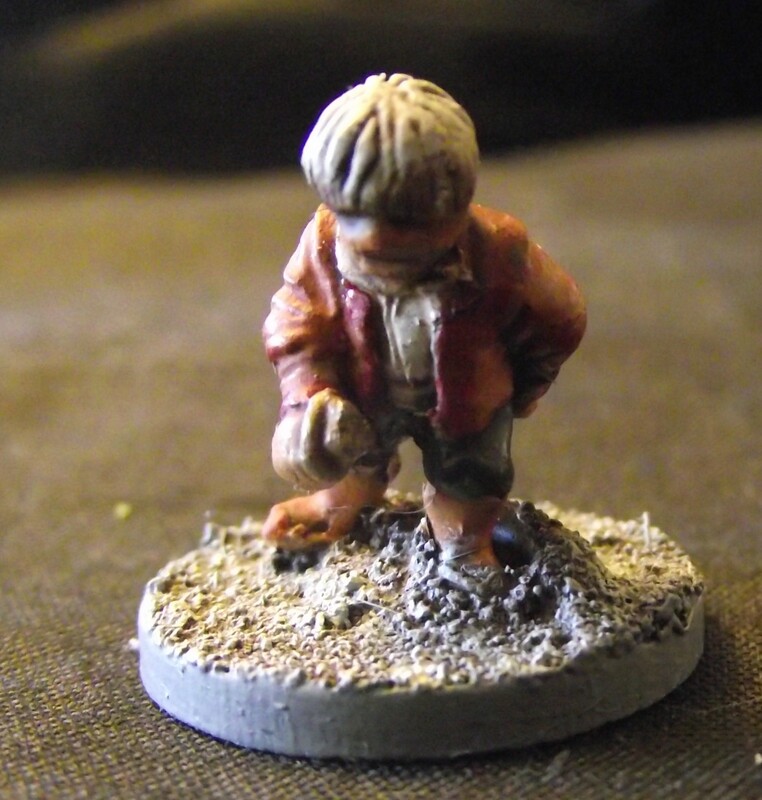 A Halfling which I have a feeling is a minifigs figure – but I might be wrong. I think he had a sword/knife at some stage, and I might rebuild it (or make it an ice cream cone or something! ).He will be with the company during the first dungeon delve, proving there is an ‘I’ in team. 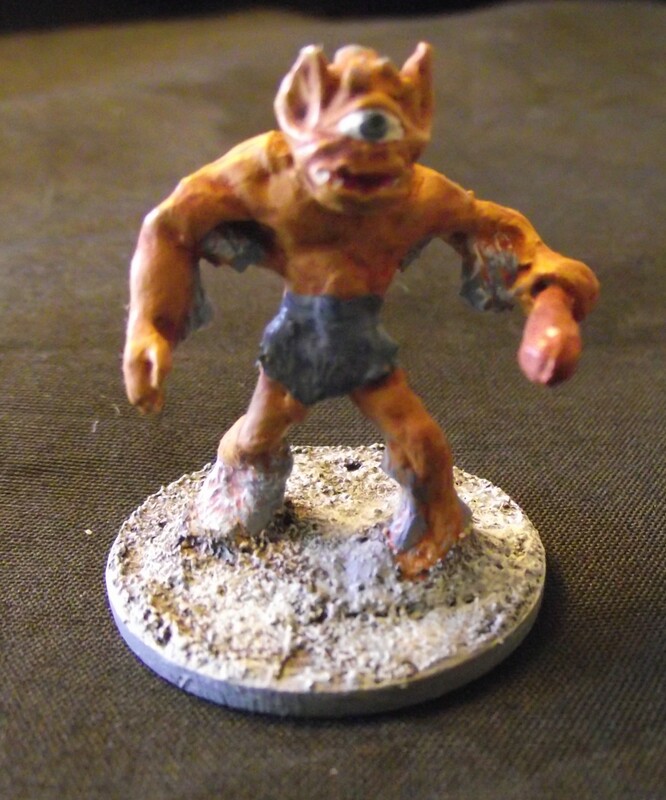 Next an old Ral Partha cyclops. I stripped Daves old enamel paint and gave it a quick simple paint job. Dave had put a pin into its hand by way of a weapon (this is how it was done way back then!). This came off during the paint stripping and I have replaced it with a club from my Warlord 28mm Plastic Celtic warriors sprues. I’m sure it good have been a better paint job but it will do……. 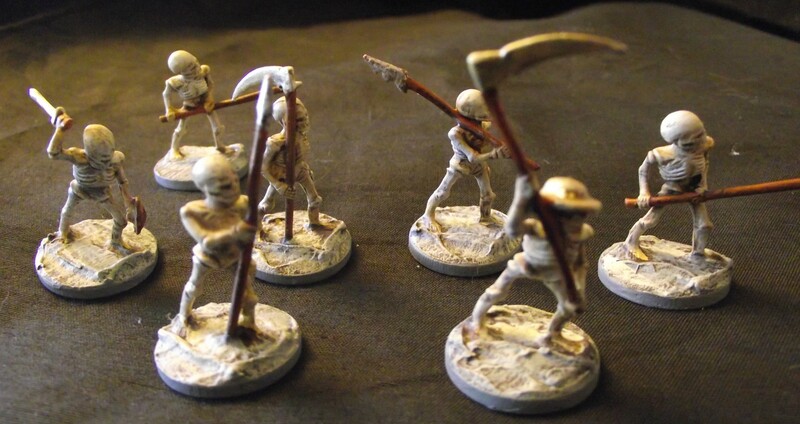 Next, the Skeletons. Or skelentons as we used to call them. These are original Valley of the Four Winds figures from 77/78 (it’s on the base). I think because of the large heads/skulls they draw some inspiration from the artist Hieronymus Bosch………. I enjoyed painting these – stripped off Daves paint job, quick undercoat, quick wash and almost done. Nice and easy. I wish I had more – I realise you can still buy some of them on the Minifigs page at Caliver Books at £1.80 a pop – not sure that’s good value for money!! Strangely when I was young I bought the Valley of the Four Winds board game – until now I hadn’t made the connection to the figure range. Duh! The board game didn’t work and has long since fallen apart/gone in the bin.